Showing only posts tagged epicray. Show all posts. 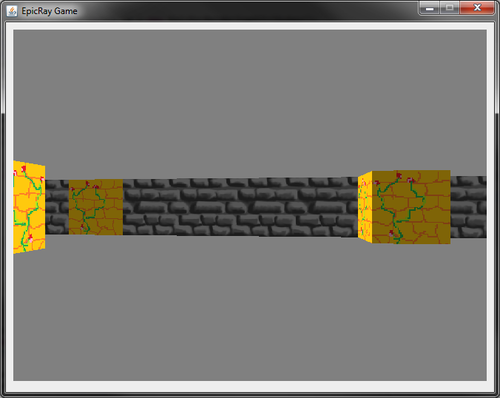 An open source Ja­va – yes, se­ri­ous – ray­cast­ing game en­gine, aban­doned, but you can find it on GitHub again. I love to op­ti­mize and Ja­va gave me a chal­lenge here. I fol­lowed a C tu­to­ri­al back then to get the ba­sic math down (which I was not com­fort­able with back then) and was al­so in­spired by a game by Notch. 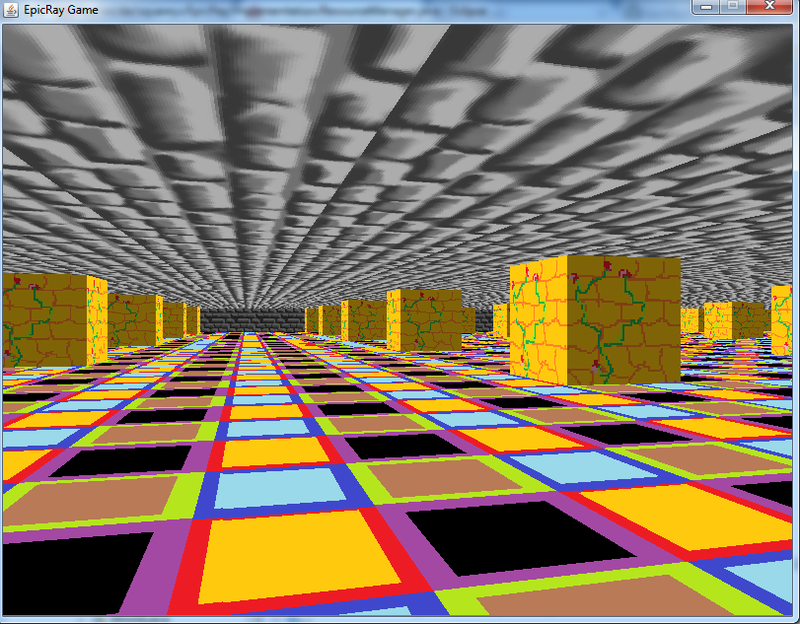 I op­ti­mized the hell out of the en­gine which was able to dis­play a tile-map of tex­tured 3D CPU-ray­cast­ed blocks. Us­ing thread­ing and main­ly cod­ing tricks I got the thing from iirc some­thing low­er than 20 fps to over 120 fps. Which says noth­ing, be­cause I don’t re­mem­ber the specs of the Note­book it ran on… or the res­o­lu­tion… or any­thing. It had an ed­i­tor though, in which you were able to build tile maps and add cus­tom tiles, with an or­tho­graph­ic vi­su­al­iza­tion of the tile etc. And I learnt what mip-maps are and how to gen­er­ate them, be­cause the ar­ti­facts were just too hor­ri­ble. I just cre­at­ed a new repos­i­to­ry for Epic Ray on GitHub! Epic Ray En­gine in ac­tion. Posted by Jonathan Hale on Thu 21 June 2018 in misc. Tags: epicray, game-engine, rendering, java, raycasting, open-source, lifestyle. 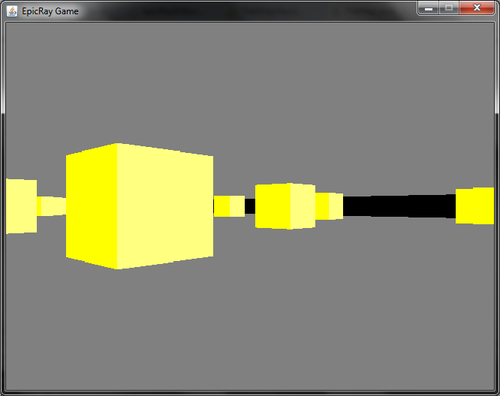 Re­cent­ly I added mul­ti-thread­ed ren­der­ing sup­port to my open source ja­va ray­cast­ing game en­gine. Posted by Jonathan Hale on Thu 21 November 2013 in tumblr. updated Thu 17 May 2018 archived Tags: epicray, game-engine, rendering, java, raycasting, optimization. Ep­i­cRay now has cor­rect floor and ceil­ing tex­tur­ing! Will push to github in a few secs. Posted by Jonathan Hale on Wed 23 October 2013 in tumblr. updated Sat 19 May 2018 archived Tags: epicray, game-engine, rendering, raycasting, java, gamedev, open-source. Posted by Jonathan Hale on Wed 28 August 2013 in tumblr. updated Thu 17 May 2018 archived Tags: epicray, game-engine, rendering, java, raycasting. Al­so, Ep­i­cRay has a ba­sic ed­i­tor, play­er move­ment (wasd). Posted by Jonathan Hale on Mon 20 May 2013 in tumblr. updated Sat 19 May 2018 archived Tags: java, epicray, game-engine, rendering, raycasting. Posted by Jonathan Hale on Sun 19 May 2013 in tumblr. updated Sat 19 May 2018 archived Tags: epicray, game-engine, rendering, open-source, raycasting, java. May 15 2013 Epic Ray, Yay! Posted by Jonathan Hale on Wed 15 May 2013 in tumblr. updated Sat 19 May 2018 archived Tags: epicray, game-engine, rendering, raycasting, java, open-source. Posted by Jonathan Hale on Sat 26 January 2013 in tumblr. updated Sat 19 May 2018 archived Tags: java, epicray, game-engine, rendering. Squareys.de – Copy­right © Squareys, 2012-2018. All rights re­served.